We interrupt our regularly scheduled alphabet series to jump to the letter V! I've had this VOTEVOTEVOTE ribbon for ages (yay ebay!) and whomever had it before me certainly had it for a while, so, I declared it vintage and knew that today was THE day that it needed to make a debut. I was right. I really couldn't wait another 4 years, could I? 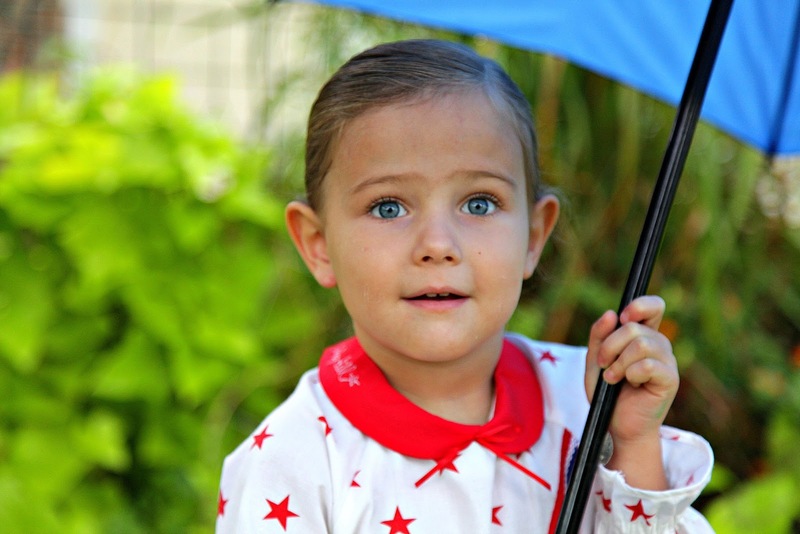 Of course it was raining this morning as we went to take photos, but fortunately we happened to have a blue umbrella. You know me and color coordination. Clover was distraught that she didn't have red, white OR blue shoes, (she's just as obsessed) but she doesn't really have room to complain with her expanding wardrobe, now does she? I think she was more excited about this dress than any other, especially since her sisters have been talking non-stop about the election and voting. She felt like she was a part of it all. 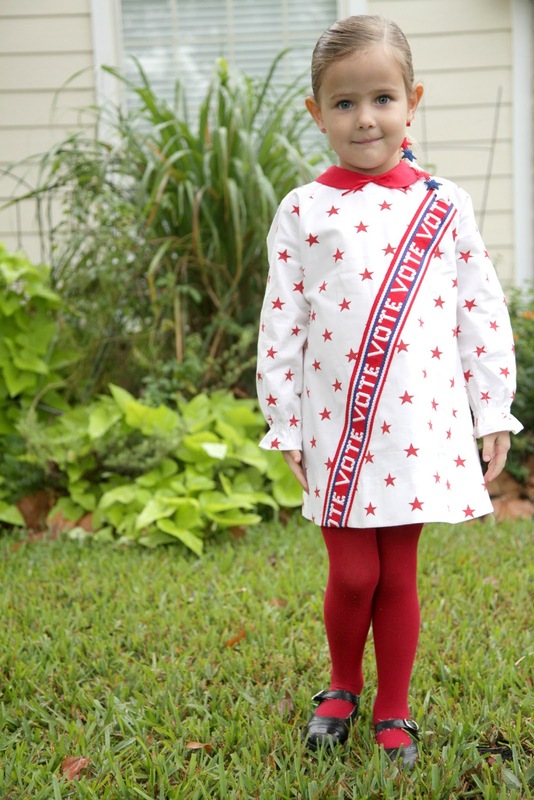 She calls it her voting dress. I was eeking out the last details last night of hand sewn button loops and the ribbon on the front and had it laying out for Clover when she woke up. Time to VOTE! Not only is the ribbon vintage, but the pattern came from Ryan's mom (grateful she had it in her stash, even though she had 3 boys) and it just happened to be size 4! Even then, I added 2 inches to the hem. I think I'm going to have to combine letters H & I to catch up, but this. This just couldn't wait. this is just about the cutest thing i've ever seen! This just made my day! I can't imagine anything better for Election Day. Great job, Katy! And please tell Clover great job encouraging us all to get out and vote too. :) She is so precious! 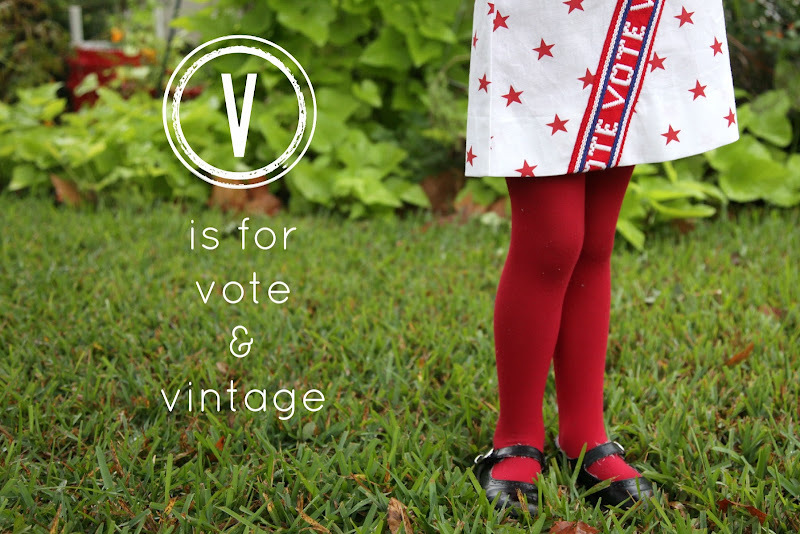 This dress is gorgeous and I love how involved and excited so many kids are about the election. 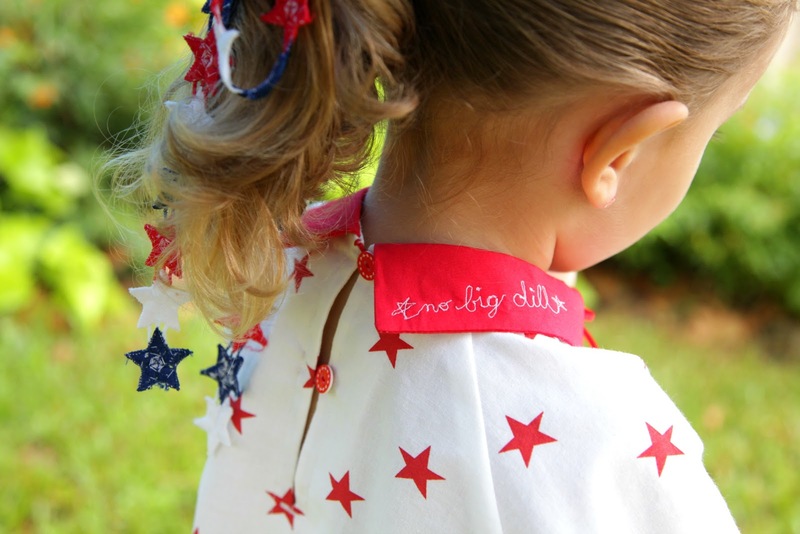 Love the ribbon and the star fabric and you always seem to pick the perfect buttons! Very, very cute! Our family is all dressed patriotically today (with a lot of campaign t-shirts on and red, white and blue) but nothing quite as cool as this. 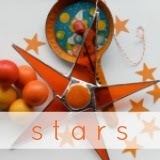 Not to mention hooray for getting it up on the blog just hours later!? LOVE the dress and Women for Votes sash. SO great! That will be passed down for generations. Clover looks adorable! perfect. i absolutely adore this dress! A VICTORY! I wish I had one in my size. Thank you for sharing, made my day. WELL DONE! ;) I love that part of Mary poppins! Very cute dress! Clover is just a doll and the dress is amazing...I especially love the collar! Too cute not to comment! So great. Thanks for sharing. Adorable! You should bring her voting with you! My two girls went with me and they thought it was great! Love it! And the Mary Poppins refrence. When I was little I watched it every day. that is by far the cutest thing ever!! 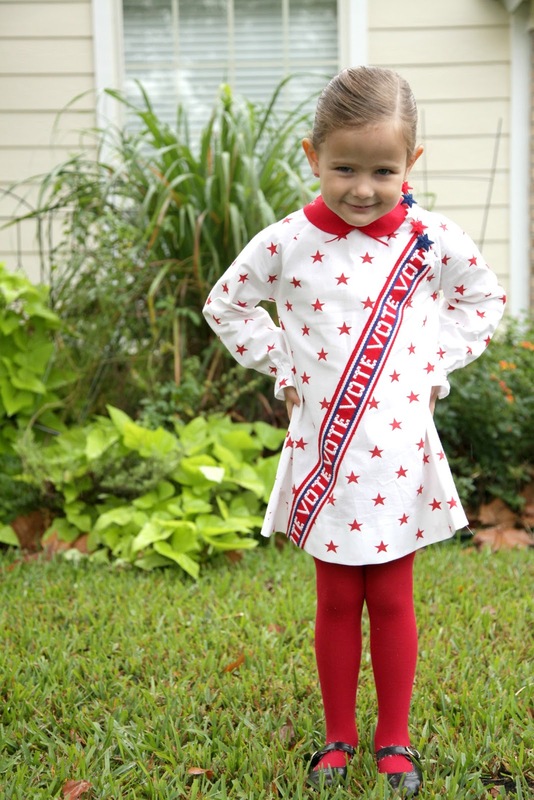 i so wish i would have thought to dress my girls up this morning in red, white and blue before we went to the polls. 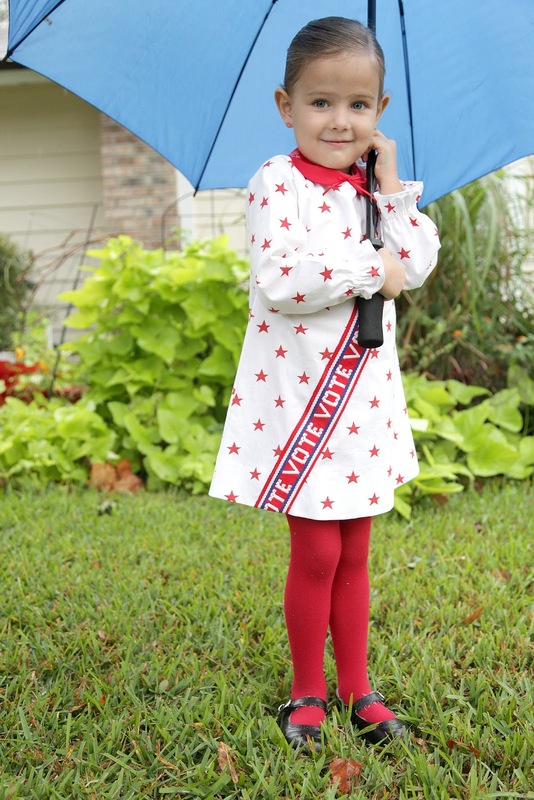 my little girl was born 4 years ago on voting day:) shame on me for not thinking that one up:) but i will admit i was totally eyeing the red, white and blue polyester fabric that was hanging from the voting booths. Darling dress! It made me think of Mary Poppins when I first saw it too. Happy Voting Day. This could not be any more adorable. 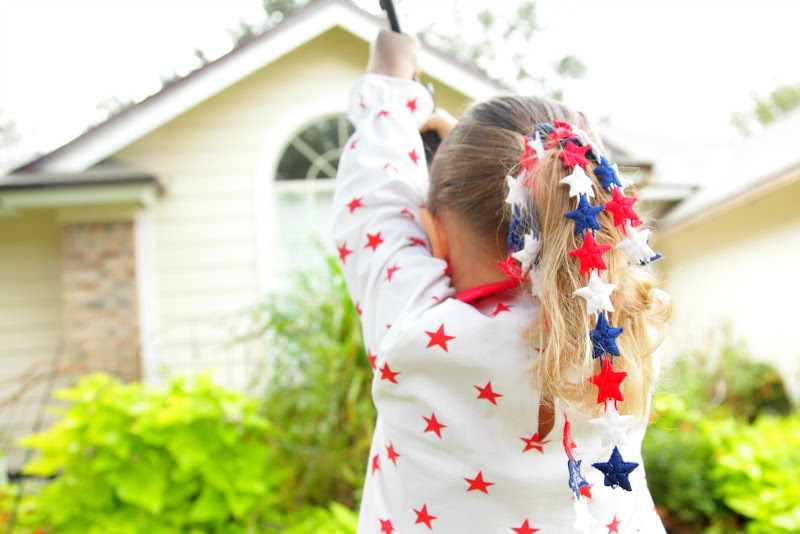 Your family will remember this sewing adventure forever. Love it!! Thanks for sharing. I await each new letter with great anticipation. Love it! And am sort of glad I'm not the only one with that song running through my head today! No, you certainly couldn't pass up this opportunity! It would be such a shame to make that ribbon sit for another four years. The dress came out so cute! Love all the little details. =) And I really love that you wrapped Clover's hair in stars... it's the perfect touch. I love the dress and Mary Poppins! So so cute. I am more than envious of your VOTE ribbon. Oh yes. I vote Katy Dill for pres. aubreyp--sure! swing by any time! So cute Katy! I love that you used V for Vote today, perfect! Ah!! This is just so fabulous!! Haha I second Jessica's nomination! If you can run a household of 6 Baby Dills, I think you can definitely run the country. Love this dress so much!! Well done, sister suffragette! 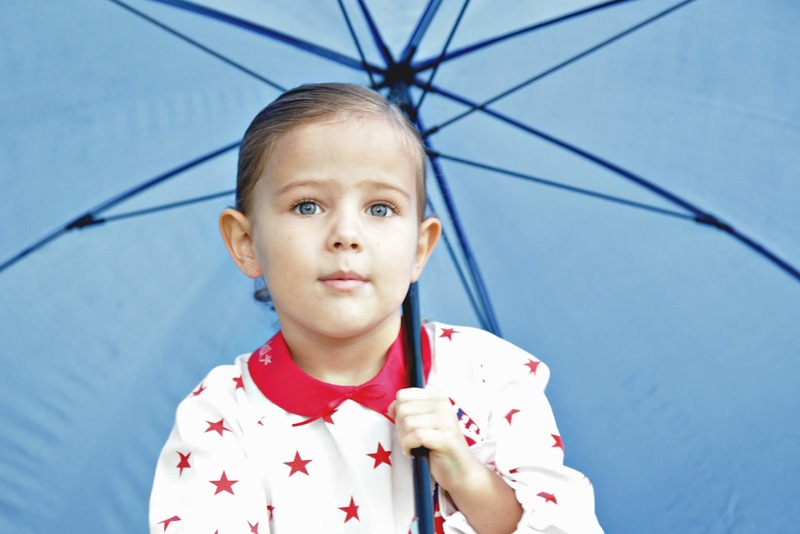 This is so adorable and immediately made me think of Mary Poppins too! I LOVE this!!! Great job, once again, Katy! If this doesn't inspire anyone to go out and vote, nothing will! Clover is so irresistible!!! ok, you outdid yourself! Such a perfect little model and a cute dress too! Perfection!! You are so clever! The ribbon immediately called to mind the suffragettes' sashes! Clover is yummy as usual!! awwwww. how adorable! i must go vote now. 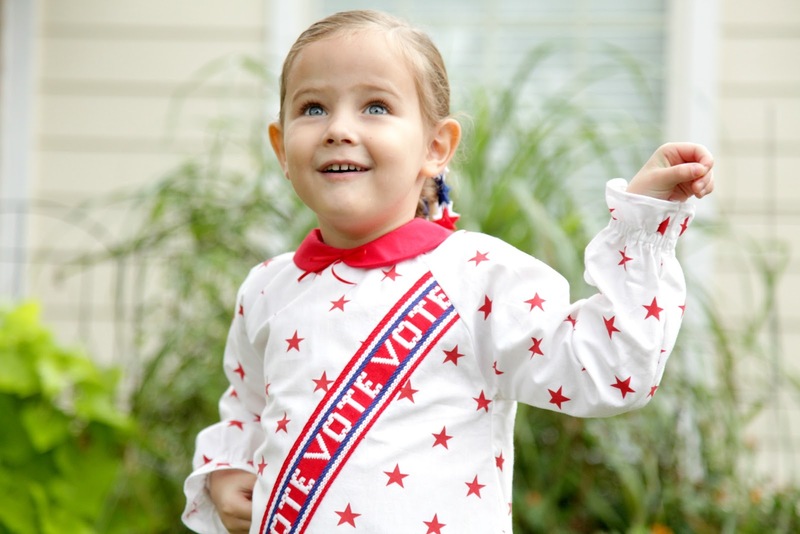 Adorable & the best "get out the vote" ad I've ever seen! Yea for Voting! & well worth having to combine H & I for! LOVE the dress! Absolutely adorable! The dress and the girl are beautiful! Adorable dress (so well modelled too) and great message. My Great Grandmother was a suffragette, so not voting is not an option in our family. Not unless I want to hear about it at every family get together forever more! H and I - I wonder what it will be! What a cutie. I bet she did indeed get tonnes of people to vote. Oh Katy, you've out done yourself. 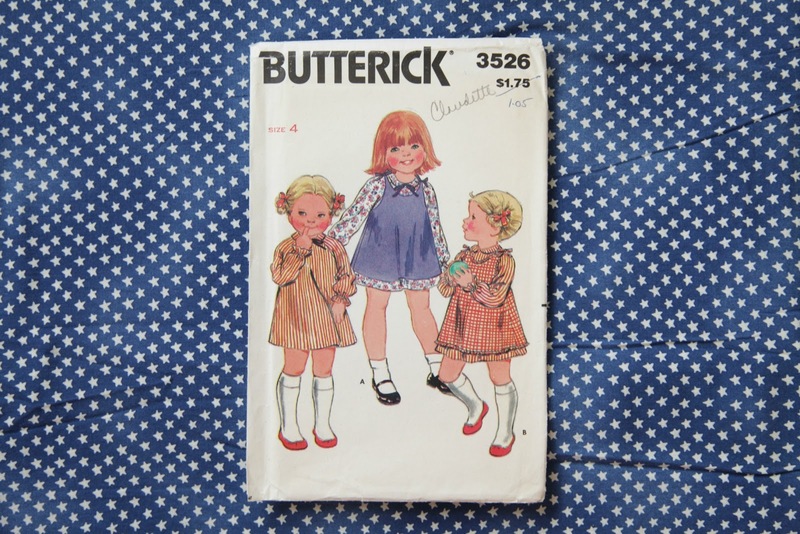 Good for Claudette for having saved that pattern all these years! OH MY WORD!! LOVE LOVE LOVE!!! !